Over the weekend, we celebrated with a family birthday party. The birthday boy got to pick the dinner menu which consisted of grilled pork chops, mushroom risotto, and grilled asparagus. I got to pick the birthday cake and ending up choosing a decadent Oreo Cake. Clearly I was not on top of my game, because when I preheated the oven to start the Oreo Cake recipe, I realized that I was out of cocoa powder, so I had to improvise because time did not permit a trip to the market for more cocoa powder. I did, however, have a box of Devil’s Food Cake in the pantry, so I went with it. After assessing my refrigerator, I decided to doctor up the cake mix to create a rich, moist and delicious Oreo Cake recipe. Doctoring up cake mixes is not something that I do often, but it’s not something I’m totally against either. 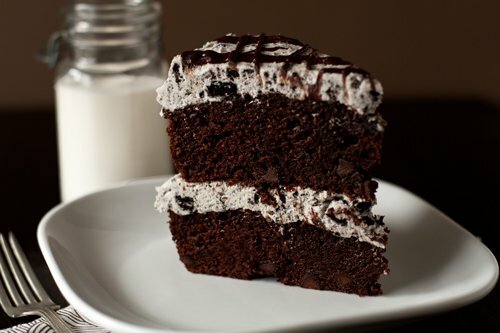 Personally I have had some pretty fabulous results from some boxed mixes and this Oreo Cake is no exception. It is truly one of the most moist, chocolaty cakes that I have ever made and the addition of the Oreo buttercream may seriously make you weak in the knees. I jazzed up the top of the cake with a little ganache which certainly added more chocolaty goodness to an already amazing cake. 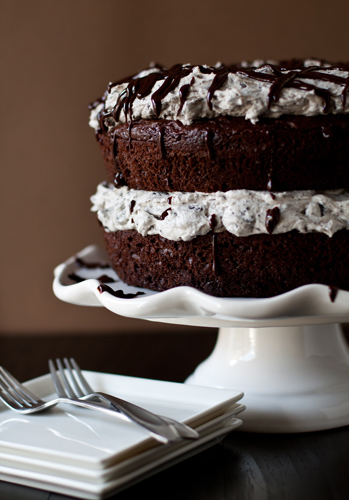 The scrumptious Oreo Cake is perfect for an upcoming holiday, yet simple enough for every day. Preheat oven to 350 degrees F. Line the bottoms of (2) 9 inch round cake pans with parchment and grease pans thoroughly. In a large bowl, mix together the cake and pudding mix, salt vanilla, sour cream, oil, beaten eggs and water. Stir in the chocolate chips and divide batter into the prepared pans. Bake for 30-35 minutes, rotating pans half way through baking the baking time. Bake until the top is springy to the touch and a wooden toothpick inserted comes out clean. Cool cake for at least 30 minutes before inverting. Allow cake to cool completely on wire rack. Cream the butters in the bowl of an electric or stand mixer. Add the vanilla extract and combine well. Begin adding in the sugar and mixing thoroughly after each addition. After all of the sugar has been added and mixed thoroughly, begin adding the very cold milk… one tablespoon at a time, combining well after each addition until you reach the desired consistency. Fold in chopped Oreo Cookies and frost your cooled cake layers. I thought this cake was just OKAY. True, the cake was very moist (I did sub Greek yogurt for the sour cream) but I found the cake had a weird after taste.. but eating it with the butter cream it was fine. I rate 3 out of 5. Just wanted to let Christine know that the Greek Yogurt may have given the aftertaste to the Cake. The Greek Yogurt has a stronger tartness than the regular Yogurt sold. Try the Recipe again without the Greek Yogurt & see if that was the cause. Well you used Greek yogurt when you should of used sour cream. That’s why the flavor was off. Next time use what it calls for instead of complaining that it tasted weird ! I made this and it was a huge hit however I’m picky myself and thought the cake was cloyingly dense. Is there any way to lighten up the texture? What if anything should I add or subtract from the recipe?? You need an entirely different recipe to make a light cake. This cake mix adaptation is meant to make a denser, more pound cake like texture with all the added fat from the sour cream and extra oil. The denser texture helps support all the chocolate chips too. You could make the cake following the box instructions and then adding just 1 cup of mini chocolate chips to the batter. First dust the chocolate chips with a little cocoa powder or flour in a ziplock bag – this will help to keep them mixed in the batter so they don’t sink to the bottom of the pan so easily. I have made this cake for two birthdays and cupcakes for Halloween. Making it again for my friend Megan, by request! Everyone loves loves loves this cake! It’s a winner! How far in advance can I make the cake, would a day before be ok, just put it together the day of? I am sorry I wasn’t able to get back to you before Easter. The recipe is always best the day of; however, if you need to bake the day before, you can store in an airtight container and it should taste delicious, as well. Have a great day! I just want to say that I love your blog, and I was finally able to try out this Oreo Cake recipe…It was stunningly delicious! I made a couple adjustments to the cake decoration, but otherwise followed your recipe as written. It went splendidly, and I humbly invite you to visit the post on my blog — Pass the Cocoa. Thank you so much again for the wonderful recipe, and have a happy Memorial Day! Thank you so much for stopping back to let me know about your experience with the cake! Have a wonderful day and thanks for following MBA! Around how long does it take to make? I’d guess this takes about an hour from start to finish, including baking time. How can i store this? Well it still be good next day if i put it in the fridge? Great recipe by the way!! Thanks for your sweet comment! It should store okay in the refrigerator for a day or two, covered in plastic wrap or in a glass cake stand with lid. This cake was amazing!!!!! My husband said it blew his mind with how much it tasted like a giant Oreo and not just flavored with oreo!!! It was so moist and delicious!! That’s so nice to hear! I’m so happy to hear that you and your husband enjoyed the recipe! Have a fantastic day and thank you for following MBA! This is probably a stupid question, but should I keep this refrigerated? It looks great! Janie, you should definitely refrigerate this cake after a couple of hours, and keep it in the fridge between servings. This recipe is a hit! I have to try it this weekend! By the way, I never use pudding mix for cake batter before. What’s the advantage using pudding mix? Fira, the pudding mix makes the cake even more moist. I made this cake for my boyfriends birthday on Dec 5 and he absolutely loved it!!!! The cake was so decadent and rich. The buttercream was delicious! However, this might have been a mistakeo n my part but after frosting my cake, I put it in the refrigerater and took it out in the morning to find that the buttercream was stiff. I dont know why that was. Did i do something wrong? Did i whip the buttercream to much? When I let the cake sit out on the table for a while it started to soften up a bit but its not as creamy as i thought it would be. Please let me know what i did wrong! All in all, I found this really easy to make and one of the best cakes that i have made so far! Thank you for this recipe! I will be making this again. maybe in cupcakes next time! YUM YUM!! That’s wonderful to hear! I’m so happy that it was a success. When you put the buttercream in the fridge, the butter just hardens up…you didn’t do anything wrong! Happy holidays and thanks for following MBA! what is ganache and where do I find it in the grocery store? Can’t wait to make this cake for a holiday party I am having this Friday. I’ll let you know. Linda, Ganache is a glaze made from chocolate and cream. You can’t typically buy ganache because of the heavy cream it calls for. Hi. I’m making your recipe right now. It says the box is 18.25 oz. But the boxes in the grocery story that I picked up which are pretty standard say 15.25 oz. Was this a mistake or should I measure out 3 more ounces? Thank you. This recipe was written before cake mix makers started making their mixes smaller. The basics of the recipe (bar the chocolate chips) are pretty similar to my other “doctored up” cake mix posts, so check this one out – https://www.mybakingaddiction.com/cake-mix-recipe/. That should help you adjust this recipe to your needs. The frosting will stay the same. This sounds heavenly! Question for you…. You say to line pans with parchment paper and to grease. Do I line just the bottom of pan by cutting parchment paper to fit and grease sides? Or grease then put cut parchment paper on bottom? It’s not a silly question, no worries. Line the bottom of the pan with the paper and grease the sides. You won’t need to grease under the paper. Thanks so much! If the cake mix already has pudding in it do I still need to add the additional instant pudding to the recipe? Yes, you will still add the dry pudding mix. Thanks for stopping by! The recipe calls for 1 1/2 pounds of confectioners sugar. How many cups does that come out to? Looks great can’t wait to make it. Just want to be sure it comes out right! My boyfriend is still talking about this cake i made him for his birthday! He was in love with his cake (he’s obsessed with oreos, so this was perfect for him). I’ve decided to make this in capcakes this time for my superbowl party! Excited to see my friends reaction! im sure that they will be a hit! Thank you again! How did the cupcakes turn out? I’m thinking of making it into cupcakes for my husband’ birthday as well. Did you adjust anything to make them? This looks absolutely amazing! Can’t wait to try this! Looks so relish can’t wait to try it at home! Just one quick question, for the Oreo Buttercream, it says 1 stick of Salted Butter and 1 stick of Unsalted Butter. How many Gram is 1 stick equals to? Sorry, it’s just that I live in Australia, all of our butters come in a block.. I have a 15.25 oz box of cake mix. Can I keep all of the other ingredients the same in this recipe using this cake mix? Hi Shaan, the Oreo buttercream would be wonderful on cupcakes. Thanks for stopping by. how many cups of powder sugar does 1 1/2 pounds make. Thanks. I keep mine in a large canister. I think it would be 6 1/8 cups. I hope this helps.